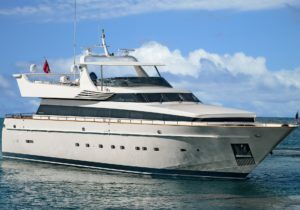 ARRIVEDERCI IV is a true world cruising capable yacht with four staterooms for owner and guests, three staterooms for crew, day head, large flybridge for tender and water toys, plus terrific aft deck and salon plus formal dining. The garage / gym opening transom creates a huge platform for water activities or “Beach Club” at ocean level, a feature usually found only on much larger yachts. Original owner yacht, built to and maintained in Lloyds Registry classification since new, stabilizers and bow thruster and Atlas universal electrical system, ready for her next cruising adventure. See in the show!